Not much has changed in the last week, and I don't foresee much change this weekend. 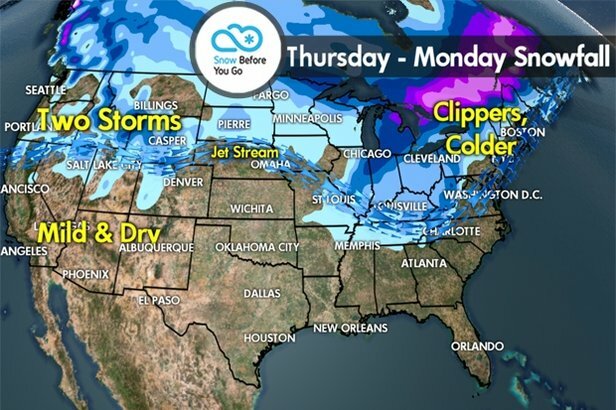 The Northeast remains colder with numerous blasts of cold air and Alberta Clippers. Out West, the storm track has shifted north keeping much of the West abnormally warm. Northeast: Temperatures start mild on Thursday but turn much colder on Friday and Saturday behind a storm system. Precipitation starts as rain or rain/snow at the ski areas and then turns to snow into Friday morning as colder air filters in; light to moderate accumulations across northern New York, Vermont, New Hampshire and Maine. An Alberta Clipper may brush those same areas with light snow Saturday night into Sunday morning. Temperatures then warm on Sunday ahead of another Alberta Clipper on Monday. California: Mild and dry until a storm system brushes northern California (including Tahoe) with rain/snow between Friday night and Saturday morning. Light snow accumulations. In fact, the rain/snow line may be rather high. Another similar storm system races in Sunday night into Monday, once again brushing northern California (including Tahoe) with light snow. Utah, Colorado and New Mexico: Mild and dry until a cold front swings through Saturday afternoon through Sunday morning in northern Utah and northern Colorado. This front looks to deliver light to moderate snow accumulations and a lot of wind. That's it until a storm system arrives Monday night through Tuesday. That storm looks much more impressive. New Mexico remains dry until the second storm system. Idaho, Wyoming and Montana: Mild and dry until a storm system arrives Saturday through Sunday. The big problem is the mild temps. That may push the rain/snow line rather high initially and it will be windy. Light to moderate snow accumulations higher up at the ski areas. 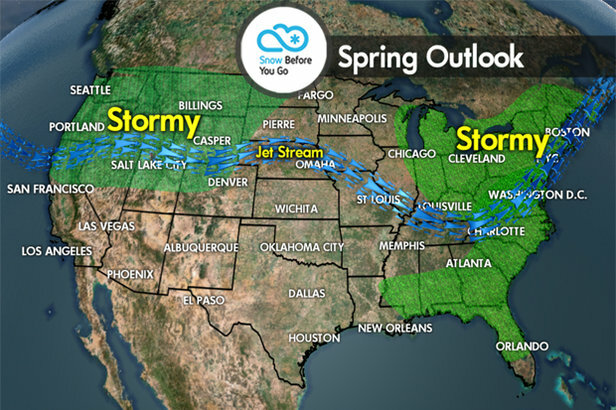 A second storm system arrives Sunday night through Monday. This storm looks colder and stronger with moderate snow accumulations. Pacific Northwest: Mild and dry until a storm system arrives Friday night through Saturday. Rain/snow levels may initially be high. Moderate to heavy accumulations above 5,000 feet. A second storm system arrives Sunday afternoon through Monday. This storm looks a touch colder, so snow will fall at slightly lower elevations than the first storm system. Moderate to heavy snow accumulations. Tomer's Take: Sugarloaf on Friday, Snowbasin on Saturday, Jackson Hole or Steamboat on Sunday. With plenty of ski season still left, here's what spring snow and skiing looks like for 2016.